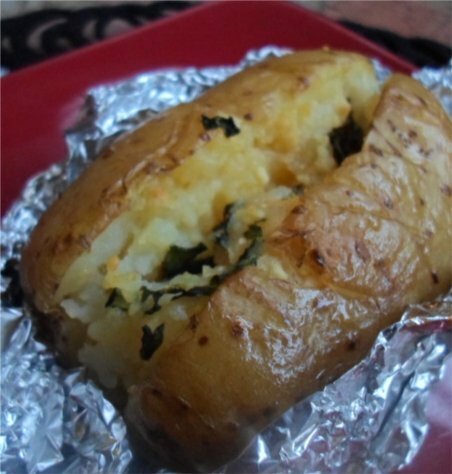 Add a new vegan side dish to your favourite meat-free braai with this Cheezly and Chive baked potato recipe. Wrap potatoes in foil and place in coals for 45 minutes. Remove potatoes from the fire. Cut in half, lengthwise without cutting right through the other side. Scoop out inside of potatoes, while making sure to leave 1 cm width skin intact for shell. Lightly mash potatoes. Add chives, diced vegan cheese, salt and pepper. Place mixture back in potato skin shells and close potatoes. Re-wrap in foil. Place back in the coals and bake for a further 20 minutes. Serve with your favourite vegan braai faux meat or roast vegetables.